Real-time data processing and conversion has never been easier. NetAcquire Data Flow tools enable you to streamline the creation of serial or network data processing setups. The NetAcquire Data Flow option enables you to process one or more input streams into one or more output streams in real time. You can publish data onto your network or send it to another output device. With the graphic Data Flow Designer, all of these tasks are completed without programming. 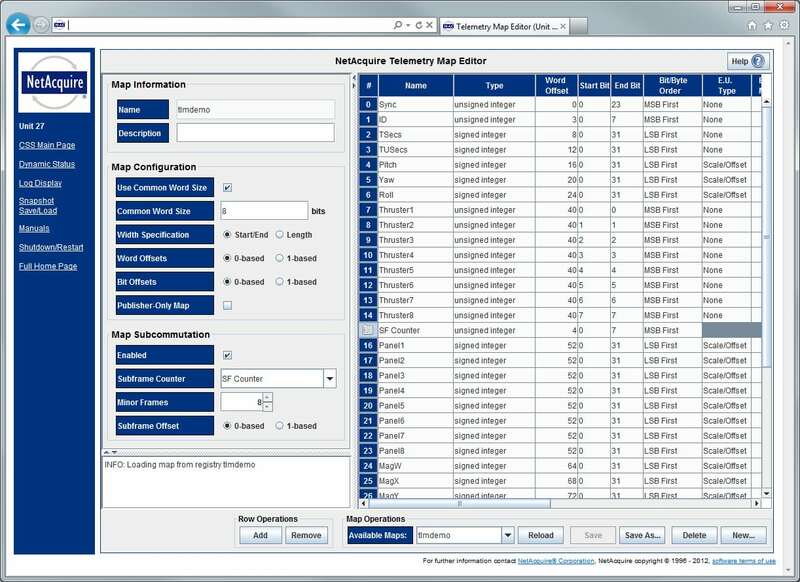 The Data Flow option is software that enhances the capabilities of the NetAcquire server to function as a configurable telemetry data processor. A data flow accepts input data from many potential sources (including serial telemetry inputs and network inputs). This input data is often processed by data extraction functions such as decommutation. Resulting data parameters can be further processed with a large library of available functions. Next, data may be reformatted into a preferred output representation. Finally, processed data leaves the data flow and is sent to a hardware output device or to the network. The flexibility and performance of the Data Flow Option enhances your data by giving you the information formats that you need most. Two Data Flow components seamlessly interoperate to offer maximum interactivity and ease-of-use: Data Flow Designer (DFD) and Data Flow Engine (DFE). Configuration is performed graphically using the Data Flow Designer. The Data Flow Designer runs locally or remotely from any computer with a web browser. This graph-based drawing environment allows the creation of a diagram depicting the flow of data through the NetAcquire server. Each block represents input, output, or processing steps. A large library of building blocks is predefined for creating data flow diagrams. The actual real-time data processing of a data flow is performed by the Data Flow Engine. The Data Flow Engine is highly optimized software running on the NetAcquire multi-core processor. The software is designed to minimize latency from input to output to maximize real-time performance. During operation, statistics information is available to monitor operation of the Data Flow Engine. Data flow conversions that perform data reformatting are possible by extracting or decommutating individual parameters from input records, optionally performing arbitrarily sophisticated computations on these parameters, and then re-assembling raw and/or derived parameters into output frames using a commutator with a user-specified output format. This data reformatting operation is expressed in a clear and powerful data flow representation; the flexibility of this extensible framework allows easy configuration of both simple and complex data reformatting applications.